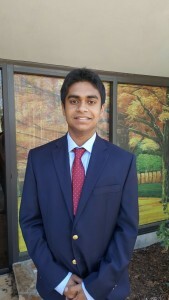 Manav Mathews, a senior at Chamblee Charter High School, has been named the 2017 STAR student for DeKalb County by the Professional Association of Georgia Educators (PAGE) Foundation and the DeKalb Chamber of Commerce. To obtain the Student Teacher Achievement Recognition (STAR) student designation, a student must have the highest SAT score taken during one sitting throughout his or her senior year. At the end of the student’s junior year, he or she must also be in the top 10 percent or be among the top 10 students numerically, whichever category provides the largest number of eligible students in the school. Manav Mathews of Chamblee Charter High School is DeKalb County’s 2017 STAR student. Mathews has been accepted by the University of Georgia as a Foundation Fellow. He also earned recognition for co-founding the Joy Committee at Chamblee Charter High to improve mental health at the school. Manav is a National Merit semifinalist, a national AP Scholar, and a recipient of the University of Georgia Certificate of Merit. An avid tennis player since age 7, Mathews has been a member of the Chamblee Charter varsity tennis team since the ninth grade, and currently serves as its captain. Mathews represents the absolute best of Chamblee Charter High School, according to Norman Sauce III, principal of Chamblee Charter High School. Manav’s teacher, Uwe Neuhaus, echoed that sentiment.